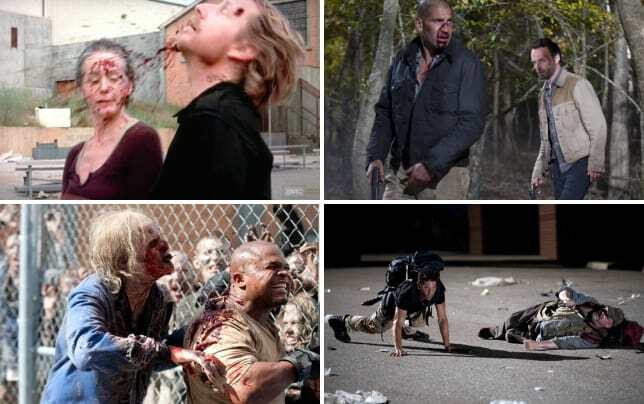 That’s what I really enjoyed about The Walking Dead Season 5 Episode 11 – that question of the unknown. There was an anticipation for something to happen, good or bad, combined with a tension that continued to coil tighter with each move Rick made at countering Aaron’s assistance and seeming sincerity. From the get-go, Rick was intense and direct, even knocking Aaron out as he tried to make his case to the group. Even I’m a bit skeptical despite wanting to believe Aaron. If anything, he’s been the most convincing person from another group, and we even got to see his care and concern for his loved one, Eric. It just doesn’t feel like an act. 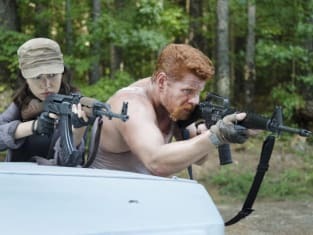 But I was glad that Rick seemed determined to play it safe, to not follow all of Aaron’s moves, to hide that backup gun outside the “safe” location. In doing so, the moments between the characters and their journey back to his group felt that much more intense. Plowing through the walkers on the road and then seeing Aaron panic escalated the situation. Even Glenn getting separated from the group made me think for an instant that perhaps The Walking Dead was going to off another character despite just killing off Beth and Tyreese. There was such a nail-biting feeling throughout. I couldn't decide whether to stick with Rick’s hesitation or to side with Michonne about holding onto that hope. I loved Rick's and Michonne’s conversations together and that Michonne was willing to speak up and say something. It wasn’t a Ricktatorhsip going on, just a man whose experiences have made him extra cautious. I definitely believed Rick would kill Aaron if something wound up going wrong. Trust is such a huge deal in this show’s world, especially when everybody seems to have some angle. Sure, Rick and the survivors have managed to add new members. Just take Michonne’s speech about her being added to the group, or Tara joining when she was with the Governor attacking the prison. They have been able to find some good people, and I love Michonne’s optimism in this bleak world. I definitely think there was some sense of calm in Rick at being able to hear noise on the other side of the wall. Match that with the bright sun shining down on them outside the door, and it really felt like a positive change coming. I really am curious about what makes this group so different, and I want to get to know more about Aaron. He is such an intriguing character, especially in how he carries himself. Like many viewers, I’ve been watching this show for over four seasons and, if something is too good to be true, either it probably is or something bad will happen to shatter that ray of goodness. I can’t help but keep feeling like Rick, suspecting everything can’t be just perfectly alright. If this place does wind up being legit, can Rick and the others adjust out of their survival mode back to some semblance of normalcy? This was a really good episode that had me engaged from start to finish, providing some thrilling moments and really focusing on trust and the possibility of hope. We still don’t know if Aaron is telling the whole truth or what catch there is to going to the group but, after this particular hour, I’m eager to find out. What did you think of this episode? Do you still believe Aaron? Sound off below, and see that intense hour again when you watch The Walking Dead online. NOTE: The Walking Dead Season 5 Episode 12 will be titled "Remember" and air on March 1.